Nendoroid Yamada Aoi from manga/anime series WORKING!! is available for pre-order as of today. Yamada has arrived, and she wants someone to spoil her! From the popular anime series, ‘WORKING! !’ comes another Nendoroid to join the Wagnaria staff, Aoi Yamada! She comes with three expressions including an astonished face, a smiling face and a crying face. She also comes with various optional parts including a plate for her to hold and a broken plate… to show that she is the queen of breaking things! 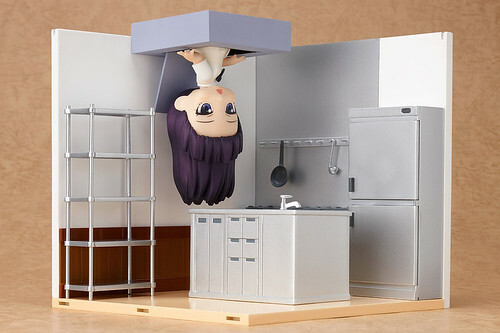 An attic door to attach to the ceiling is included along with extra hair parts to pose her hanging upside down – allowing you to recreate the scene where she pokes her head out of the attic! Wagnaria’s troublemaker is here for everyone to bring into their own homes, where you can watch over her and spoil her however you wish! This entry was posted in News and tagged nendoroid, wagnaria, working, yamada aoi.